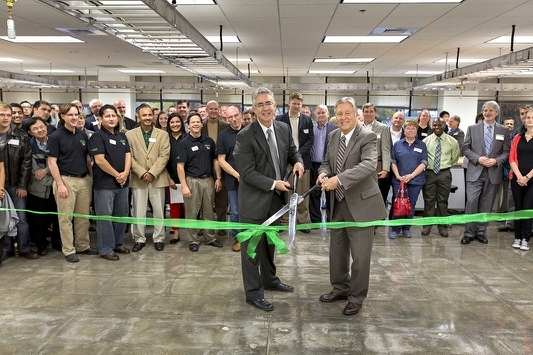 UT Dallas leaders recently cut the ribbon on a new studio for the university’s Erik Jonsson School of Engineering and Computer Science’s UTDesign award-winning corporate-sponsored capstone senior design program. At more than 30,000 square feet, the new UTDesign studio is one of the largest in the country according to program leaders — housing 29 project stations, which can be expanded to 56. The studio includes a computer lab, a machine shop, seven conference rooms (including a Cisco TelePresence room), five secured project lab rooms, a seminar room, and more than $550,000 in state-of-the-art equipment donated by local companies. The Jonsson School Industrial Advisory Board (IAB) is a council of more than 60 representatives from nearly 40 companies and organizations who serve the school on a volunteer basis as advisers to its academic and research programs. 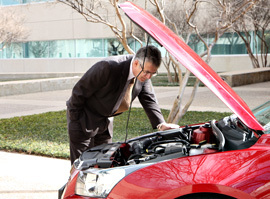 Most are senior technical personnel or corporate officers from the local high-tech industry. Others are leaders of civic and trade organizations such as the Metroplex Technology Business Council, the City of Richardson and the Denison Development Alliance. The board is led by co-chairs Xiaolin Lu and John Randall. Xiaolin Lu is Distinguished Member of Technical Staff (DMTS) in Texas Instruments and Manager of Smart Grid R&D in Micro Control Unit (MCU) department. During her employment with Texas Instruments and Microware Systems Inc., Ms. Lu has assembled R&D teams to start up new business opportunities. She holds 22 US patents (11 are as first author), 63 pending award patents, and has 5 published papers in multiple research areas. Ms. Lu and her team invented the concept of the Universal Media Access Controller, smartPower, Harmony Radio co-existence technologies with some of them in high revenue-generation products. John Randall, president of Zyvex Labs and co-chair of the Jonsson School Industrial Advisory Board, has more than 30 years of experience in micro- and nano-fabrication. He joined Zyvex Corp. in 2001 after 15 years at Texas Instruments, where he worked in high-resolution processing for integrated circuits, microelectromechanical systems and quantum effect devices. Prior to TI, he worked at MIT’s Lincoln Laboratory on ion beam and X-ray lithography. He holds 25 U.S. patents and has published more than 100 articles in scientific journals in the areas of semiconductor lithography and quantum devices/circuits as well as metrology, ohmic contacts, atomic layer epitaxy, reactive ion etching, MEMS and X-ray fluorescence analysis. UTDesign helps companies expand their resources by taking advantage of the skills, energy and enthusiasm of talented engineering and computer science students. The program connects companies to teams of senior students from the Erik Jonsson School of Engineering and Computer Science eager to find solutions to companies’ problems, and offering fresh ideas and bold creativity. Student teams are assigned projects proposed by their companies. The teams work under the guidance of faculty advisors and maintain regular contact with industry mentors. At the end of the project, which serves as the capstone of students’ undergraduate education, all results are turned over to the corporate partner. • Project management, including planning, budgeting, communications, scheduling and presentations. • Adaptability, reliability and flexibility. The program, started in 2009 with just six projects in electrical engineering, now boasts more than 40 multidisciplinary projects each semester in computer science, and computer, electrical, software, telecommunications and mechanical engineering. UTDesign collaborates with students from the University’s Naveen Jindal School of Management and Arts and Technology (ATEC) programs. When biomedical engineering seniors join UTDesign next year, all of the engineering and computer science programs will be together in one facility. Last semester, UTDesign received the Tech Titan of the Future Award from the Metroplex Technology Business Council, the largest technology trade association in Texas. 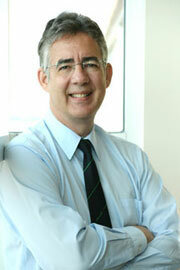 Dr. Spong has spent entire career working to transform robotics from science fiction to present reality. His work has been instrumental in establishing the theoretical foundations of robot control, and he has produced innovative solutions in robotics that have stood the test of time to become now-classic results in robotic control. His record of achievement earned him the 2011 Pioneer in Robotics and Automation Award from the IEEE (Institute of Electrical and Electronics Engineers) Robotics and Automation Society, that organization’s highest honor. Also past president of IEEE Control Systems Society and a fellow of the IEEE, Dr. Spong has served as editor-in-chief of the IEEE Transactions on Control System Technology. 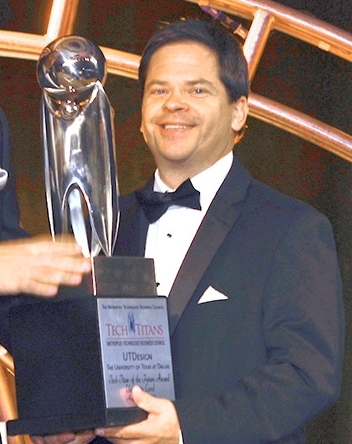 His other notable honors include the first IROS (Intelligent Robotics and Systems) Fumio Harashima Award for Innovative Technologies in 2007, the Senior Scientist Research Award from the Alexander von Humboldt Foundation, the Distinguished Member Award from the IEEE Control Systems Society, the John R. Ragazzini Education and O. Hugo Schuck Awards from the American Automatic Control Council, and the IEEE Third Millennium Medal. One UTDesign team moved into one of the secure project rooms before the official launch. Team members are known for spending any spare time in the new studio. “If we are not in class, we are over here,” says James Smiley, an electrical engineering senior and member of the eBike team. The eBike project is sponsored by Texas Instruments, and is housed in a project room accessible only via access code designated for teams working on proprietary projects. John Randall comments that project security is critical for potential corporate sponsors, and praises UTDesign leadership for finding solutions. “That fear is largely alleviated because, from the very start, UTDesign leaders had these kinds of projects in mind,” says Mr. Randall. While the studio is primarily for UTDesign students, several engineering student organizations, such as the BattleBot team, will have dedicated space in the studio. Hernandez, the BattleBot team member, says having the space will make them better at building their robot. Before the studio opened, pieces of the 120-pound robot would have to be transported between campus, a student’s home garage and a sponsor’s corporate office in downtown Dallas. The studio will also be home for some student organizations, such as the UT Dallas BattleBot team. The new studio is located at Synergy Park North at 3000 Waterview Parkway in Richardson, and replaces the former studio that was housed in the Waterview Science and Technology Center (WSTC). That space is now used for faculty offices. “At a time when the most pressing needs and the most challenging problems at UT Dallas are finding space and other resources to accommodate our very rapid growth, the support of Provost (Hobson) Wildenthal and President David Daniel, who enabled the construction of this facility, is truly remarkable and affirms not only their commitment to engineering education, but also their vote of confidence in me, in faculty and students and sponsors,” says Dr. Spong, who is also holder of the Lars Magnus Ericsson Chair in Electrical Engineering and the Excellence in Education Chair. Corporations who sponsored equipment for the new studio include Agilent Technologies, Cisco, HP, MSC Industrial Supply Co., National Instruments, Newark, PTC, Stratasys and Texas Instruments. Equipment donations included a 3-D printer donated by Stratasys. A tablet created by MSC was provided for the first inventory vending machine.